Writing an Android Sync Provider: Part 1 – Did You Win Yet? The first piece of the puzzle is called an Account Authenticator, which defines how the user’s account will appear in the “Accounts & Sync” settings. Implementing an Account Authenticator requires 3 pieces: a service that returns a subclass of AbstractAccountAuthenticator from the onBind method, an activity to prompt the user to enter their credentials, and an xml file describing how your account should look when displayed to the user. 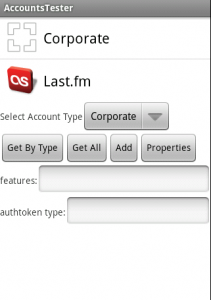 You’ll also need to add the android.permission.AUTHENTICATE_ACCOUNTS permission to your AndroidManifest.xml. The authenticator service is expected to return a subclass of AbstractAccountAuthenticator from the onBind method — if you don’t, Android will crash and reboot when you try to add a new account to the system. The only method in AbstractAccountAuthenticator we really need to implement is addAccount, which returns an Intent that the system will use to display the login dialog to the user. The implementation below will launch our app’s main launcher activity with an action of “fm.last.android.sync.LOGIN” and an extra containing the AccountAuthenticatorResponse object we use to pass data back to the system after the user has logged in. *  otherwise our activity will just pass the user's credentials on to the account manager. If you don’t already have a login screen, there’s a convenience class AccountAuthenticatorActivity you can subclass that will pass your response back to the authentication manager for you, however if you already have a login activity in place you may find it easier to just pass the data back yourself, as I have done here. When the user has successfully been authenticated, we create an Account object for the user’s credentials. An account has an account name, such as the username or email address, and an account type, which you will define in your xml file next. You may find it easier to store your account type in strings.xml and use getString() to fetch it, as it is used in multiple places. The account xml file defines what the user will see when they’re interacting with your account. It contains a user-readable name, the system account type you’re defining, various icons, and a reference to an xml file containing PreferenceScreens the user will see when modifying your account. Now we’re ready for testing! The Android accounts setting screen doesn’t handle exceptions very well — if something goes wrong, your device will reboot! A better way to test is to launch the emulator, run the “Dev Tools” app, and pick “AccountsTester”. You should see your new account type in the list, along with the built-in “Corporate” account type. Go ahead and select your account type from the drop-down list, and then press the “Add” button, and you should be presented with your login activity. After authenticating, your account should appear in a list below the buttons. 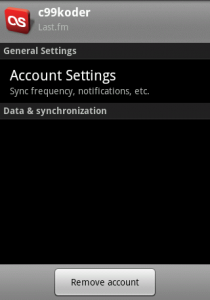 At this point, it should be safe to use the system “Accounts & Sync” settings screen to remove or modify your account. Ready to fill in that section below “Data & synchronization”? Let’s move on to part 2! The source code for the implementation referenced here is available in my Last.fm github project under the terms of the GNU General Public License. A standalone sample project is also available here under the terms of the Apache License 2.0. Google has also released their own sample sync provider on the Android developer portal that’s a bit more complete than mine. i’m a student and this is my first year in collage. i got a homework from my java lecture about webservice. he ask every students find an android applications that implemented webservice. then i choose your apps, srobbler last FM. but, really confused how they work. he asking everyone of us to explain it clearly. 1. how your apps can shown wiki artist? 2. are you stored all the info bout artist on a database? 3. how can i describe the process? i read in many websites, they talkin bout soap, WSDL, XML,etc. but still didnt get it. then, i moved to forum, but still didn’t get the reply. I really hope u can help me. I have some question on Android built-in sync. Can i fire onPerformSync() method when i click a button in a app? How can i set period of sync? I have an error when calling addAccountExplicitly.. in my activity..error says “caller uid 10075 is different than the authentication uid”.. I am sure that my authenticator.xml account type is the same than activity`s account object. <service android:name="AccountAuthenticatorService"… is this name come from package.serviceClass? I have seen more examples where put ".authenticator.serviceClass"
Any ideas about all this? 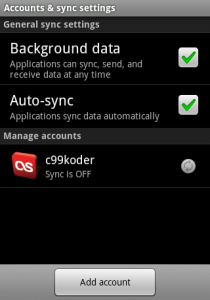 For using your tutorial, i have create account and show contact sync menu in Account & Sync. I don’t understand, how to sync with own server. where we place code for contact sync? Please reply me, i am waiting for your response. Hi is there a way to do contacts synchronization without using a token at all? I want to send username and password only. I see that it is less secure, but is there a way to do it and how to do it? I searched but I couldn’t finds any example without using a token. I did exactly what you said. But I am not getting anything when I tap on Add button in Account Tester. do we need to change it to our package? I need to sync contacts from all accounts. Is it possible? 1. Which is Best Approach to development Email Synch Client( Exchange or Lotus Domino) is it token based or Push Method or is there any other method?. 2. Which would be consume less battery?. I am using this code. But giving error. After giving this error. my phone is hanged and now is not restarting. Can you help me. This solution is not working on Android devices and the Samsung or the Android Lollipop. Do you have any idea what might be happening?